You will want to watch it, and you'll want to watch it right to the end, because someone is taking 'It's Time to Fly' WAY too seriously. Take a look at the BAR team in training on the foiling Nacra F20. 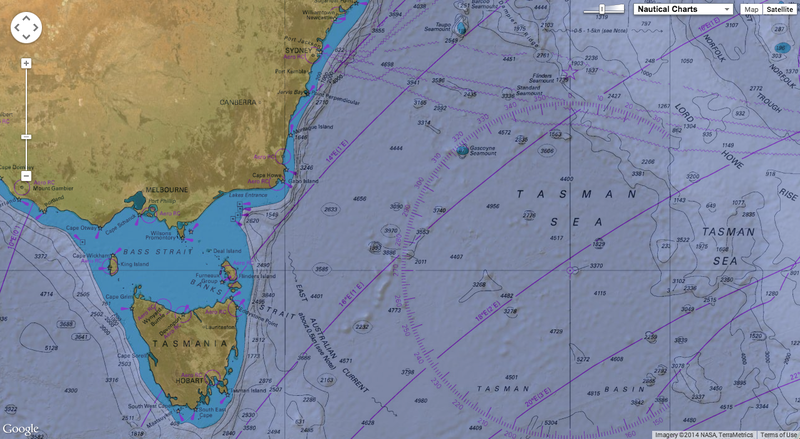 Rolex Sydney Hobart Yacht Race : who knows what danger lurks at sea? It is not just the wind and the waves that can play nasty tricks on an ocean-racing yacht. There is also what lies beneath. The latest reminder of this fact came earlier this month when the Volvo Ocean Race entry Team Vestas Wind struck something in a remote stretch of the Indian Ocean northeast of Mauritius. “I assumed at that point we had hit a container or a whale, and in about 10 seconds or so there was all this crashing and grinding,” said Brian Carlin, the crew’s on-board reporter. In fact, while moving at about 20 knots the boat had run aground on a reef, allegedly as a result of a navigational error. The incident left a stranded, significantly damaged $6 million yacht and a crew of nine badly shaken but ultimately very fortunate sailors who had to abandon ship and await rescue. 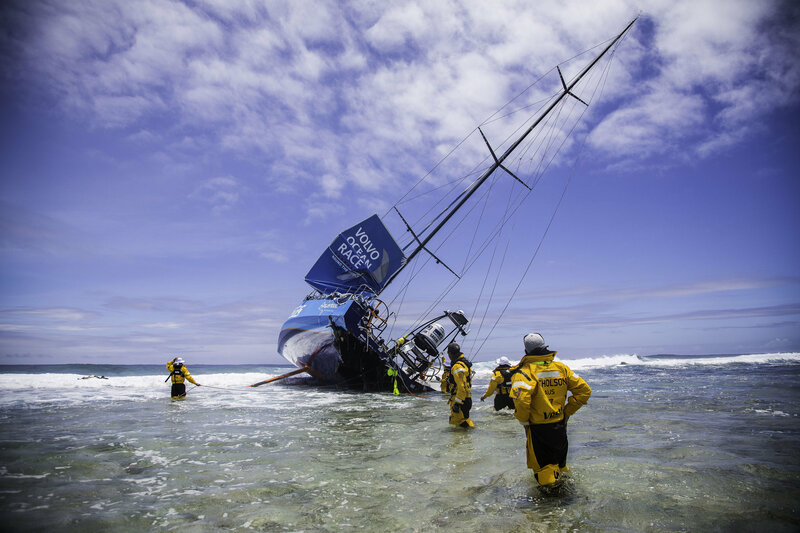 The crew of Team Vestas Wind with their boat after it ran into a coral reef near Mauritius in early December. From whales and giant sunfish to oil drums and plastic debris, numerous possible hazards to the big ocean racers’ chances and safety abound beneath the surface of the sea. The Rolex Sydney Hobart Yacht Race, which begins in Sydney Harbor as usual on Dec. 26, will not travel through any part of the planet that is nearly so isolated as that. The race is in its 70th year, and the knowledge and the charts of its route are extensive. But there are hazards below the surface all the same. In 2012, a Reichel Pugh 51 named Secret Men’s Business hit what was believed to be a whale. The boat went from 20 knots to a dead stop in an instant and it was flung on its side, with the mast nearly touching the water. The bottom section of the rudder was sheared off, although the crew did find a way to finish the race. Many other types of vessels are also involved in whale or shark collisions, according the International Whaling Commission. In fact, according to the commission’s data, the highest number of collisions come from whale-watching vessels. Overall, the commission reported, a quarter of all recorded collisions lead to the death of the whale, and many result in injuries. In the Hobart race, Slow-moving ocean sunfish, with an average adult weight of about 1,000 kilograms, or 2,200 pounds, are another problem. Although they spend much of their lives at considerable depth, the sunfish sometimes bask near the surface, where they can be hard to spot from a fast-moving ocean racer. Mark Richards, the skipper of the supermaxi Wild Oats XI, said the boat had three separate collisions with sunfish in 2005, one of the years in which it took Hobart line honors. Other sailors have been forced to retire their yachts from the race after such collisions. “The sunfish are a large threat because they don’t move, and they are so huge that they always pose a risk,” said Sean Langman, a veteran Australian skipper. Langman added that a collision with a shark during the 1999 race sheered off a rudder. Unlike with sunfish, he said that climate change appeared to have increased the threat posed by whales. “Even though we’re approaching our summer and most of the sea life has migrated south, there were so many whales around Australia when I brought the boat from Tasmania last month,” he said. A severe storm disrupts the 1998 Sydney to Hobart Yacht Race and destroys several yachts. Will Oxley, an Australian marine biologist and navigator, has been a regular participant in the Hobart and is now the navigator for the Volvo Ocean Race team Alvimedica. “I can’t really speak to what actually happened on board Vestas, but for us, obviously this is a part of the ocean where there’s only been one previous race, and so there is no history to refer to,” he said in a telephone interview from Abu Dhabi last week. But Oxley, who has taken part in the last three Volvo Races and whose first circumnavigation was in 2001, emphasized that the hazards now often are found much closer to and are a result of civilization. “Historically, the Volvo Ocean Race spent the majority of time racing in very isolated places, with albatrosses and icebergs,” he said. Near the coast of Oman, meanwhile, drift nets were a main concern. “If you happen to be unlucky enough to encounter the middle of a net without warning, then avoiding it may be impossible and apart from the damage they can cause, you can easily get tangled up and have to send a person into the water to clear yourself,” Oxley said. Follow seven international teams as they race 38,739 nautical miles around the world in the 12th edition of the Volvo Ocean Race. Along with being the foremost offshore sailing competition, the race reminds us about the vastness of our Oceans and what it means to be a modern day explorer. One of the tools Oxley and Alvimedica have deployed is a night-vision scope that allows them to look ahead and avoid obstacles. But there is clearly an element of luck involved. In 2003, the French sailor Olivier de Kersauson and his crew, who were participating in the round-the-world Jules Verne Trophy, said that a giant squid had affixed itself to their yacht, bringing it to a halt in the open ocean before the creature then released it. “Honestly, whether we’re sailing big multihulls or these supermaxis going incredibly fast speeds, you just go sort of on faith that the odds are in your favor, and sleep with your feet facing forward,” said Peter Isler, an American who is the navigator for the supermaxi Rio 100 in this Hobart. “Whether you are racing to Hawaii or across the Irish Sea or down in the Bass Strait, you are just going for it,” he added. That means things like partially submerged containers that have fallen off ships. Or things like floating railroad ties or beams. Or things like a coral reef in the Indian Ocean in the middle of the night. The Dolphin Dance Project produces films about communication between humans and wild dolphins through dance. The Dolphin Dance Project works only with wild dolphins. Dolphins are not rewarded or coerced by anything other than their own curiosity and joy to interact with intelligent, playful members of another species - just like the human dancer. Recognizing that we are guests in the dolphins' environment, the filmmakers followed a strict code of etiquette. There is never any attempt to interact if dolphins are resting or show any sign of annoyance or disinterest. Long time ago, a young woman of extraordinary beauty was forced by her father to marry a bad shaman who took her on an island, far from her home. Unhappy and never ceasing to cry, she eventually succeeds to soften her father who came to remove her in secret. But when they fled by boat, the shaman realized it and unleashed a terrible storm. And so begins the story of Sedna, goddess of Greenlandic waters, where is sailing the boat "La Louise" with a crew of skiers from France and Switzerland. Tracking recent environmental changes, with 10 essays prepared by an international team of 63 scientists from 13 different countries and an independent peer-review organized by the Arctic Monitoring and Assessment Programme of the Arctic Council. One of the ways our planet manages its heat budget is by storing solar energy in the oceans. In recent years, the Arctic has been taking in more than its usual share of heat energy, which could be bad news for our steadily warming planet. This latest dire climate update was presented by NASA scientists here at American Geophysical Union meeting on Dec. 17. The map above was made using heat-sensing, satellite-borne instruments that measure the rate of solar radiation change. In the Arctic, the rate of heat absorption has increased by more than 10 Watts of energy per square meter since 2000. 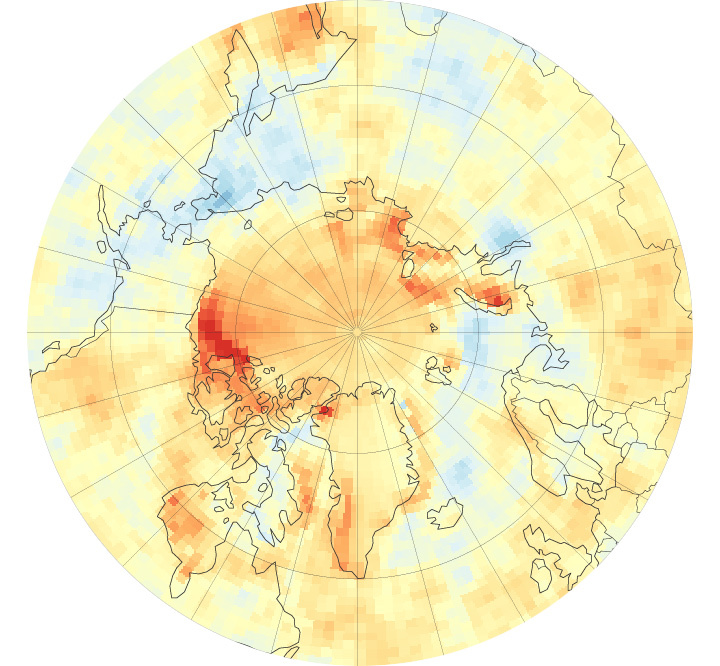 In some areas—like the big red blob representing the Beaufort Sea north of Alaska—this rate has increased as much as 45 Watts per square meter. The Arctic Ocean is absorbing more of the sun's energy in recent years as white, reflective sea ice melts and darker ocean waters are exposed. 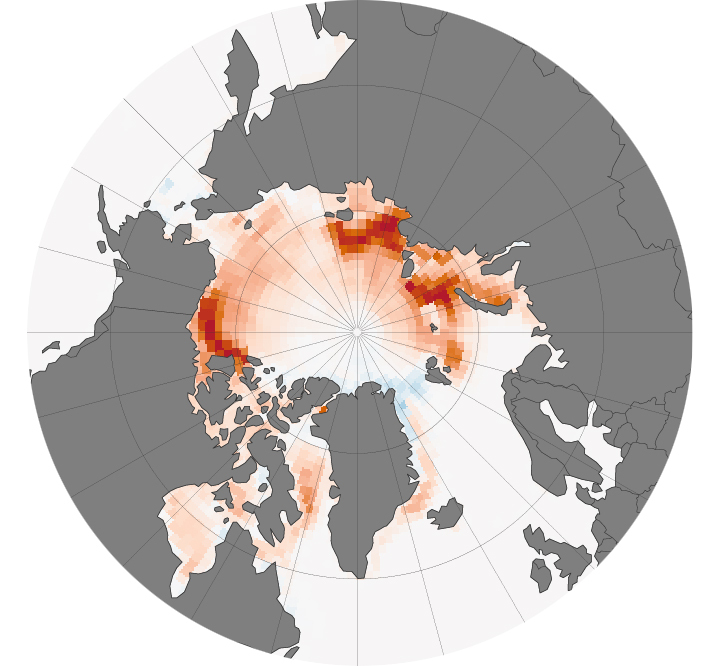 The increased darker surface area during the Arctic summer is responsible for a 5 percent increase in absorbed solar radiation since 2000. Not all of the sun’s energy sticks around on Earth. Different land surface types bounce it off back into space, while others absorb it. Ice, snow and clouds are really reflective. Water varies, depending on the angle of the sun. For the past 15 years, NASA has been using a satellite sensor called CERES (on three different satellites, Terra, Aqua and Suomi-NPP) to calculate how much solar energy is being absorbed versus bounced back into space. Every summer, the Arctic ice cap partially melts away, and freezes again in the winter, covering more or less (OK, mostly less) the same area it has in the past. But, because recent years have had record levels of sea ice loss, a lot of that winter ice is barely a year or two old, and less than 6 feet thick. When summer comes back around, this thin ice melts quickly, exposing the ocean below to solar radiation. Since 1982, the average onset of the annual summer melt season has moved up by seven days. As scientists continue to monitor the Arctic for changes in the face of climate change, they recently discovered some staggering new information - temperatures in the region are rising twice as fast as anywhere else on Earth, a new NOAA-led report says. This creates a solar radiation feedback loop. The thin ice melts earlier in the summer when the sun is higher in the sky, which exposes the heat-sinking ocean surface to collect even more solar radiation. This causes a feedback loop, as more heat is absorbed into the ocean, which in turn causes more melting. Currently, the average temperatures in the Arctic are rising twice as fast as the rest of the globe. In addition, the researchers originally thought the loss of sea ice would result in more clouds forming over the Arctic, which would make up for some of the lost sea ice by reflecting back sunlight (the rest of the world’s oceans are covered by clouds much of the time). However, the cloud cover isn’t filling in, and is in fact being quite unpredictable. This is contributing to the overall rate of solar energy absorption. Atmospheric scientist Jennifer Kay of the University of Colorado, a collaborator on this research, says it’s too soon to use CERES data to confirm any long term climate trends. “Climate is usually considered to be a 30 year average,” she said at a press conference. As CERES has been collecting Arctic solar energy data since 2000, this research is only about halfway done. using only renewable energy in a project called ‘Roma Ocean World’. He is the first one-man, non-stop sailing trip around the world without any additional fuel or food stops throughout the entire journey of more than 27,000 nautical miles (roughly 50,000 km), which begins Sunday, October 19, 2014. While sailing south of Africa on an around-the-world voyage, Matteo Miceli was suddenly alerted to a massive iceberg in his path. Almost 4 km long, the iceberg drifting near the Prince Edward Islands was detected and tracked by European satellites. "According to our experience, at these latitudes the big icebergs undergo strong fragmentation. The presence of a big iceberg could be an indicator for a field of smaller fragments which could be very dangerous for the boat," said Luca Pietranera from e-GEOS, a satellite data processing company that provides information to the team planning Matteo's route. And recording the wave characteristics taken from the ECO40’s movements to produce a polar diagram of the boat’s speed, which will be useful for future Class 40 racing boats. Radar imagery from ESA's Sentinel-1A satellite and the Italian space agency's Cosmo-SkyMed were used to track the movement of the iceberg – and guide Matteo away from the treacherous waters. The benefit of radar is that it can see through clouds and in the dark, and can therefore provide regular updates on the positions of the icebergs. It may seem like an awfully cold place for a sailing trip, but Matteo is attempting to sail the Eco40 non-stop around the world using only renewable energy in a project called 'Roma Ocean World', technically lead by the 'La Sapienza' University of Rome. Even his food supply is self-sufficient. The aim is to demonstrate how modern technology, together with a responsible attitude, allows us to enjoy maritime sports while respecting the environment. During the voyage, information on the changes taking place on land and at sea are being collected, underlining the importance of monitoring the effects of climate change on our planet. drifting near the Prince Edward Islands on 14 December 2014. In addition, measurements on wind and waves are being used to check satellite data. Today, Matteo is in the Indian Ocean. "In terms of iceberg hazards, the most dangerous part of the Eco40 route will be the passage south of Cape Horn, foreseen in February. For this reason, tracking of the big iceberg there has already started," said Mr Pietranera. The 32 km-long iceberg drifting along the boat's projected route near the South Georgia and the South Sandwich Islands in the South Atlantic has already been picked up on the satellite radars. ESA’s Sentinel-1A, ASI’s Cosmo-SkyMed and NASA’s MODIS missions tracked the movement of an iceberg as it drifted in a clockwise circle near the Prince Edward Islands (right) in December 2014. 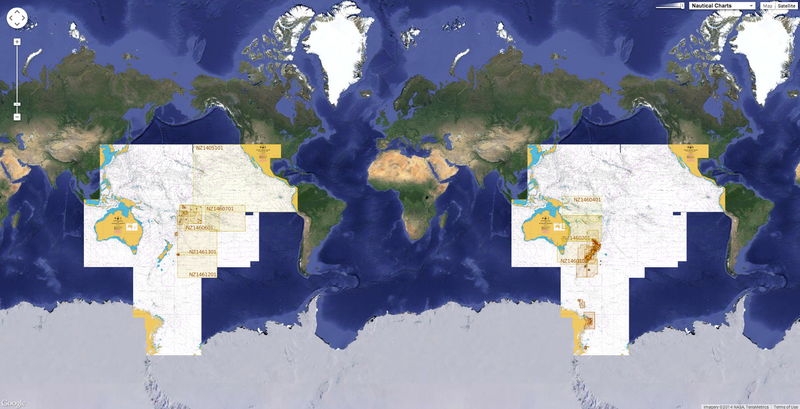 The iceberg was near sailor Matteo Miceli’s planned route (red) while on his ‘Roma Ocean World’ voyage. Instead, Matteo steered his vessel north of the islands (orange). In the coming months, Sentinel-1A will continue to cover this and other obstacles during Matteo's endeavour. The Sentinel-1 mission was developed for Europe's Copernicus environment monitoring programme and provides an all-weather, day-and-night supply of imagery of Earth's land, oceans and ice. Launched in April, Sentinel-1A passes over the same spot on Earth every 12 days. Once its identical twin, Sentinel-1B, is launched in 2016, this will be cut to just six days, so that changes such as the movements of icebergs can be mapped even faster. The B17-A iceberg, 32 km long, and its fragments south of the South Georgia and South Sandwhich Islands (top) are captured in this radar scan by Cosmo-SkyMed in December 2014.